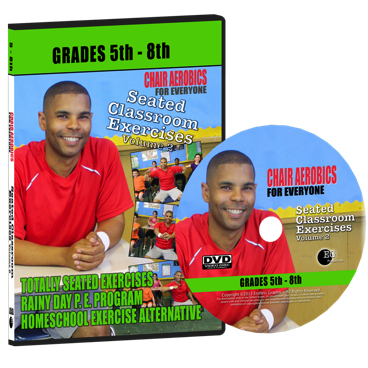 “Seated Classroom Exercises” is part of the Chair Aerobics for Everyone Series. 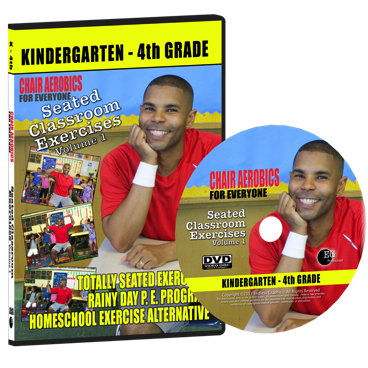 This totally seated exercise DVD has been created for children in kindergarten through fourth grade to incorporate exercise in their daily routine. Instructor David Stamps includes a variety of fun exercises and stretches that can be done either at home or in the classroom. Classroom Exercises can be used for working out on rainy or cold days when children cannot go outside. It can also be used in-between classes or anytime children need some physical activity. Classroom Exercises is also ideal for home school children that want to include physical education into their curriculum. Seated Classroom Exercises will help meet the recommended daily amount of physical activity for children.